Hamptons home seekers now have a new destination for discovering the area’s best luxury homes: SMEluxuryhomes.com. 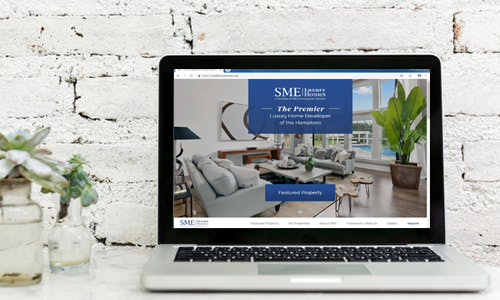 Our new website showcases the work of our luxury home building division, SME Luxury Homes, in the Hamptons marketplace. You’ll find photos, downloadable floor plans, site plans, and brochures for our current and completed luxury home creations. A centerpiece of the new website is an interactive photo gallery where you can view photos by interiors, exteriors, individual project, or outdoor living. Our Featured Property section highlights our latest project – currently 344 Main Street, a custom-designed 5-bedroom, 4 full and 2 half-bath Traditional Village residence in the Village of Sag Harbor. We also have a special section devoted to the Hamptons lifestyle, with links to information on beaches, boating, golf, tennis, shopping, fine dining, and cultural events throughout the Hamptons. We hope you’ll enjoy visiting SMEluxuryhomes.com and that you’ll check back often to see what’s new. As the premier luxury home developer of the Hamptons, we want to make your dream of owning a vacation home in the Hamptons a reality that you can enjoy now, and for years to come.